This project uses a robotic arm made of servos, builds a platform stage and stepper motor to move it and draws whatever you input to it. 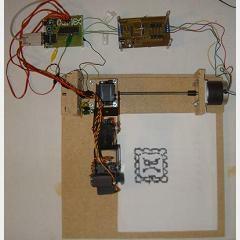 A laptop reads from a picture file and sends commands to the arm telling it what to draw and where. This project looks neat. please send info on the Dotifier.